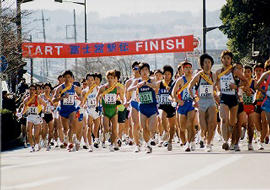 Ekiden is a long-distance road race where teams of runners compete against each other in a relay race. Each team carries and passes a sash or tasuki, instead of a baton from runner to runner. Japan’s first ekiden was held between Tokyo and Kyoto in 1917. Today, the Tokyo-Hakone collegiate ekiden, or the so-called Hakone Ekiden, is probably the most popular one in Japan. It is held annually on January 2 and 3, and is broadcast live nationally, so many people watch it on TV. In this ekiden, about 20 college teams that have won elimination races run between Otemachi in Tokyo and Hakone in Kanagawa Prefecture, near Mt. Fuji. The distance between Tokyo and Hakone is about 100 kilometers or about 63 miles. On the first day, 10 teams relay from Tokyo to Hakone, and on the second day another 10 runners from each team run from Hakone to Tokyo. The Yokohama International Women’s Ekiden in February is also famous. This ekiden has been held since 1983. It is said this race made ekiden international. About ten Japanese national and regional teams and five or six foreign teams participate in this ekiden race. Six runners of each team run the marathon distance.